Recently, it has been announced that former Superman actor Henry Cavill will be taking on the grey hair and dual swords of Geralt of Rivia, the series’ protagonist. I have to admit – I haven’t actually seen Man of Steel, Batman vs Superman or Justice League, because everyone told me they were awful. However, everyone also told me that Cavill is a strong actor. His version of Geralt is likely to be younger than he is in The Witcher 3, so we are likely going to be jumping into his story much earlier in time. 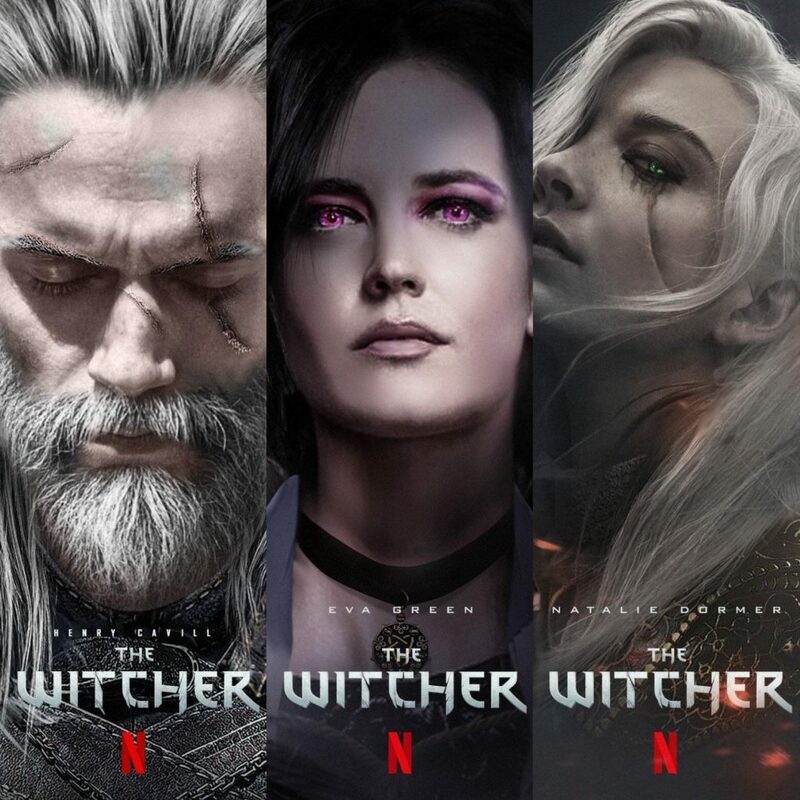 Instagram artist Bosslogic has made his own predictions, casting Casino Royale’s Eva Green as Yennefer of Vengerberg and Natalie Dormer of Game of Thrones fame as Geralt’s charge, Ciri. Eva Green would be an excellent choice, in my opinion. Not only does she already resemble Geralt’s on-again-off-again love interest in the games, but she also has the acting chops to pull off the character. Yennefer is extremely powerful, and is clearly aware of her superiority over others. Yet, she can be warm and caring, with a great emotional depth. If not Green, how about another Netflix star – Jessica Jones’ Krysten Ritter. Once again a proven badass, perhaps Ritter could emphasise a younger Yennefer’s more vulnerable side? Bosslogic’s other prediction, Natalie Dormer, is far less likely to come true. Whilst Dormer would probably be a very good fit for an adult Ciri, Netflix’s series is likely to begin the White Wolf’s story far earlier in time than the setting of The Witcher 3. If Ciri is involved at all, she would be a child. If a cute badass is required, Millie-Bobbie Brown of Stranger Things may be a good choice, although she is doubtless busy reprising the role of Eleven. Rumour also has it that Ciri may be portrayed by a black actress, despite being white in The Witcher 3. Naturally, this being the internet, that news drew plenty of criticism. If a child actor is chosen, they are likely to be a relative unknown. I’m interested to see who ends up taking on the role. Triss – Geralt’s other woman. Like Yennefer, she is a sorceress, although she is far less uptight. Redheaded actresses like Emma Stone and Christina Hendricks have been mentioned in connection with the show. However, in trying to pick a younger cast, the name that springs to mind for me is Sophie Turner, also best known from Game of Thrones. Energetic, calm and, yes, badass when she needs to be, Sophie would be a great addition to the cast in my opinion. As the final series of Game of Thrones is due to air next year, she may just have a gap coming up in her schedule. Geralt has a rich and varied backing cast, outside of the three i have focused on. Zoltan, Dandelion, Vernon and the rest will no doubt make an appearance at one point or another. Netflix have access to a huge range of actors, and the money to pay them, so I’m certain we will see some excellent casting choices being revealed over the next few months. Of course, it remains to be seen how good Netflix’s series will be. They’ve been responsible for some absolutely incredible TV, as well as plenty of utter trash. I’m hoping The Witcher will fall in the former category, but it really is too early to tell at this stage. Are you looking forward to it? Who would you pick to play the major characters in Geralt’s story? I’m eager to hear who you’d cast.